Some people might see this as a contentious post but I intend it to be entirely positive, informative, and forward-looking. Just like me! Along the way we'll establish some truths, define some terms, discard some myths, and look at the current publishing landscape. Traditional publishers can only publish a limited number of books. They usually have to schedule them well in advance. They can't publish all the good books that get submitted. In particular they are unlikely to publish a book which may be good, but which only has a very limited audience. In the past this often meant good books were never published. This is just a truth of the market. They need to make money to keep going, though sometimes a more popular book will be used to subsidise a less popular one. Now the market for books is so huge, and access to that market so open, that even niche books can be made available. Sometimes this is done by traditional publishers, maybe through electronic-only imprints: a financially-viable option they didn't have in the past. Sometimes the book is made available by the author themselves. This is great in terms of catering to all readers. It also means it is a great time to be a writer. Traditional publisher: a service provider to which an author assigns rights to publish their book. The publisher takes over many of the tasks to get the book to market; in exchange they profit from every copy sold, and pass on a percentage of that profit to the author as royalties. Called "traditional" because for a long time this was the main route from author to reader. Royalties: this is the percentage of the profit from each book sold that goes to the author. Publishers are often secretive about the figures, but I think 10-25% of net revenues is usual (10% is often the figure for print sales, or even less) in traditional publishing. Total royalties are generally dropping. Advance: a figure that may be paid to an author by a traditional publisher in advance of publication as a lump sum. It is not a "bonus" - it is the only money the author will get until the royalties surpass this figure and they start receiving royalty payments. Many books never "earn out" the advance. Self-published book: any book published by the author, with or without help. As with everything, there is a range of quality, from the unedited teenage fanfic to the professionally edited and designed book that sells a million copies. So in itself this term is nothing to do with quality, it is just about process. Self-publishing is not new. Amongst many other famous names, Jane Austen, Mark Twain, and Virginia Woolf self-published books. Nowadays independent authors get around 70% in royalties per copy sold. What Are The Publishing Options For Professional Writers Today? You can go with a traditional publisher; you can self-publish; or a combination of the two. The hybrid approach is increasingly common. Some books go from one system to another. For example the bestselling hits The Martian (Andy Weir), and Wool (Hugh Howey), began life as books published by the authors; the books were such huge successes that traditional publishers then came begging for the rights to distribute them too. It can go the other way: one of my friends is a very well-respected traditionally-published author of many great books. Some of them are now out of print and the rights have reverted to her. The titles were doing nothing - unavailable to readers and providing no income. She decided to create digital files of the texts, get them edited, design new covers, and publish them again herself. I gave her advice on all those steps. She then has some books with traditional publishers, some which she is publishing herself. The end result is a win-win situation for everyone. The key point is that you adopt the route to market that is best for the project and your own skillset. I've already mentioned some books which disprove this prejudice, but it's worth spending a bit more time on it. In an open system, anyone can contribute. Some contributions will inevitably be poor quality. Others will be fantastic quality. There will always be a range, from amateur to professional. This is not a bad thing. It is fantastic that my gran can write a memoir and make it available in print for friends and family. Yes, it may have a scrappy cover, and contain some mistakes - but she is not aiming at bestseller lists. More power to her, and everyone that creates. This is the case in every artistic sphere, not just writing. Anyone can paint and try to sell their work. Some of what people paint is probably amateur and unsellable (please don't ask me to post my "Still Life 1996" watercolour), but it's still wonderful that people try to be creative. Galleries just focus on the quality, professional stuff. Anyone can play music, write songs, and try to sell it. Some of what people create is probably amateur, unsellable, but it's praise-worthy that people try to be creative (you should hear me mis-playing the guitar - but the key point is, I'm having fun and smiling). Music shops just focus on the quality, professional stuff. Thanks to easy-to-use software, anyone can make a computer game nowadays. Some of what people create is probably amateur and unsellable, but can be distributed for free to people who might enjoy it. Game vendors like GOG just focus on the quality, professional stuff. Who decides what is the best, anyway? That doesn't change. It is always a combination of the critics, and the audience. They don't always agree, but they are the ones that we go to. Returning to my examples, it is the same with music: critics and music fans help us decide what is good, not the big music companies (big music companies only decide who to sign - often based on commercial decisions rather than quality, which is why so much chart music sounds the same). When it comes to books, the critics speak through reviews in newspapers and journals; the audience through reviews on blogs, Goodreads and Amazon. When I talk about self-published books I am talking about the quality end of the spectrum. I often use the term "independent author-publisher" to mean a professional writer who strives to make a living from writing, who self-publishes their books, who aims at excellence at every stage, creating books to the highest standards (to the extent that standards can exist in subjective topics like art and creativity). In many ways, for this kind of writer, it is a misnomer to call their work "self-published", because that implies they did it all on their own. That is incorrect. Professional author-publishers usually manage a team - saying the work is self-published takes away acknowledgement of all the people who contribute to a book. I'll clarify this in the next section. Basically independent authors are owners and founders of a small business, who have committed to it because of their passion. That's a good thing. 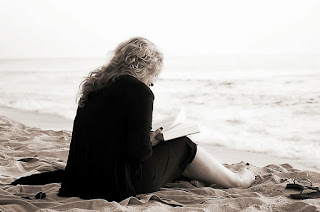 So for the rest of this post, when I talk about self-publishing I am not concerned with amateur work, only with the best: quality books by professionals. The best in this realm matches the best quality of traditional publishing, and can exceed it (after all, traditional publishers have been known to publish things of debatable quality because they know they will make money from it, such as ghost-written celebrity memoirs; generally if something sold well in the past, we will see more of it in the future!). I feel cheap starting here - it skips past the years of thinking, researching, plotting, agonising, rewriting and so on that every quality author goes through in creating their work. I'm pretending the book pops into existence, all shiny on the writer's desk, a gift from the magic book fairies with a tidy satin bow around it. Anyway, let's look at what happens to a book from the point where a decision to publish has been made. This applies both to traditionally-published books, and professional self-published books. As you can see, this involves a lot of people, and a lot of skills. Quality publishing is not free. Or cheap, even: for my books I usually spend over £1,000 per title for all the services; this article gives other figures. All the stages cost money, and one way or the other, the author pays for it. Building on what I've already said, there are two main ways to pay. A publisher acts as a third party intermediary, and subcontracts all these services, or does them in-house. In exchange they get a slice of the profit from every copy sold (which is what they're gambling on - they are investing in a title in the hopes of it being a success). So the author pays the publisher via some of the profit from each copy sold. The author finds professionals to subcontract and pays upfront for all those services; in exchange for spending time and money on the processes the author then keeps all rights and royalties. As you can see, the author always pays, with the only difference being whether they pay upfront with an initial outlay (self-publishing), or later, via reduced profits per copy sold (traditional publishing). Money isn't the only issue. All these tasks can be complex and time-consuming. Many authors do not want to engage with them, and are only too happy to go with the convenience of traditional publishing, and let the publisher deal with it all. They don't mind not having the final say in the cover or book title or edits: they just want to get on with writing. It's a perfectly valid attitude, and is why traditional publishing is the best fit for some authors. On the other hand, some authors want to deal with all this and be hands-on. They want to control the creative vision from start to end - the book title, the marketing, cover and so on. For them, professional self-publishing is the best way. They don't do all the tasks themselves but they choose who to hire, and what brief to give them; they manage the process. I reiterate: in neither case (traditional or self-publishing) does a professional author do it all on their own. The work is done by a team. As such, one route to market is not better than another. One does not guarantee quality; one does not automatically offer the best option for an author. They are both viable options, depending on the project, the market, the skills and motivation of the author and their team. • help talented writers build careers that enable them to write more." If a competition is to be legitimate it should find the best. Otherwise it is doing a disservice to everyone. To find the best it has to include all the possibilities. So the smallprint of Wales Book Of The Year excludes quality books by many Welsh authors from consideration. Based on the figures earlier, that means up to 75% of books will not even be considered. Which wouldn't be so bad if the prize was called The Traditionally-Published Wales Book Of The Year competition - at least that would be honest and technically correct. It seems unfair to exclude books based on who funds their publishing process, not on the basis of their quality. Further, Wales Book Of The Year is supported by public money. That money is to support the arts and writing in Wales: not just traditionally-published writing. The competition is currently misleading because it reinforces the mistaken idea that the only good books are those that are traditionally published "because self-published books never win prizes, never win Wales Book Of The Year" etc. 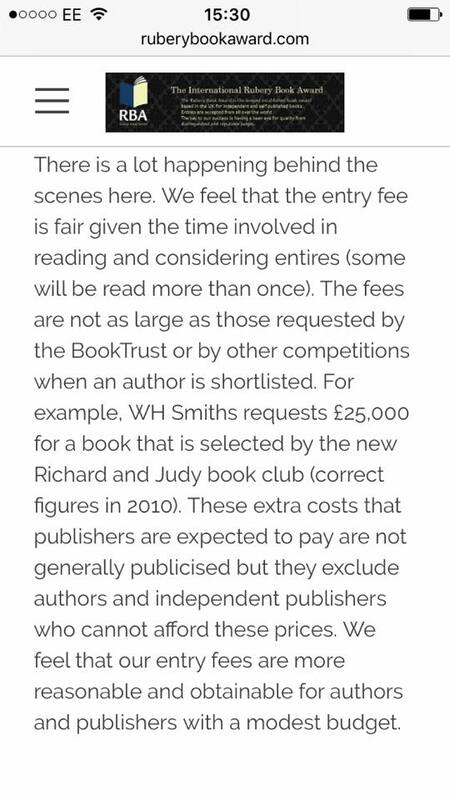 A self-fulfilling prophecy is established, when in reality self-published books can't win because they are excluded from some competitions, either through explicit criteria slipped into smallprint of entry, as here; or through a huge fee to enter or get on to a shortlist. If a competition excludes certain books then how can we ever know the winners really were the best when the field was artificially shrunk? To be valid, a competition must leave submissions open to all. In return it enhances the credibility of the prize, which benefits everyone. So it is even stranger that such a prejudice creeps into the smallprint of our biggest national writing prize. Literature Wales even admit that self-publishing does not mean low quality. This example is interesting - he's praised, his work is great, yet Literature Wales would have excluded his work from their poetry category! I should add here that I'm not bashing Literature Wales. I'm involved with the organisation in many ways. I consider us to have a great relationship. 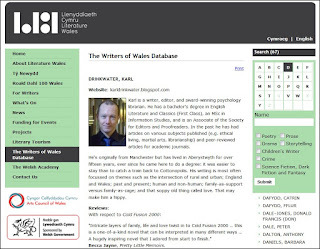 Literature Wales showed faith in my writing and awarded me a small bursary many years ago, for which I am grateful - their support gave me confidence that I had some talent. I've used their critiquing services, which were excellent - I still have the reports because of the pithy advice they contained. 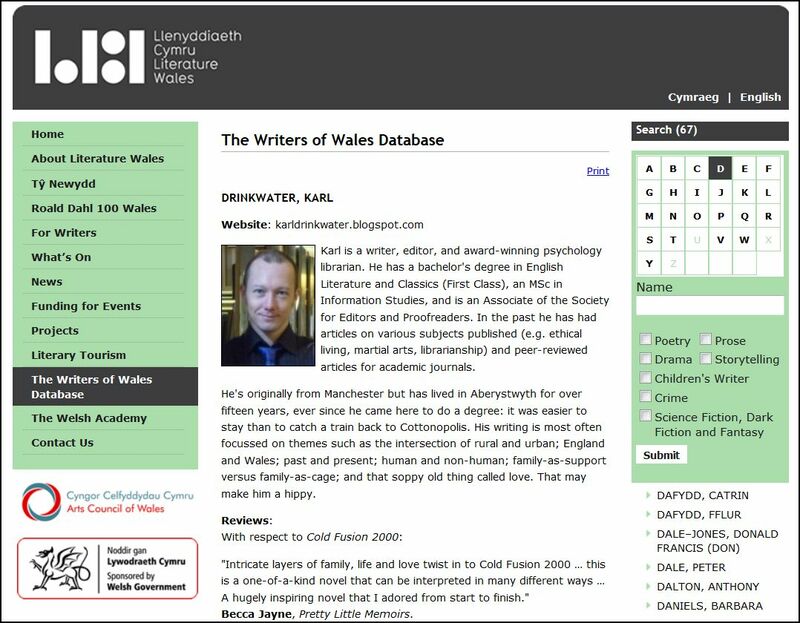 I am on their Writers of Wales database. I have been on writing courses at their excellent Tŷ Newydd centre a number of times, written about it, and promoted the courses at the request of Literature Wales staff. I'm sure I'll go again in the future. I've made many contacts with other writers through Literature Wales. Ask me about them and I'm full of positive stuff! It's just this one issue I don't understand, which seems so contrary to their general openness. Maybe this will change. My friends in Literature Wales do seem to have more forward-looking views than maybe the organisation had in the past. Perhaps there's hope to remove that criteria and make it more open, for example changing it to include only print books with an ISBN, or print books that have a copy in the National Library of Wales. In those cases at least all published books by Welsh authors would have a chance of being eligible, whether self-published or traditionally-published. Other prizes are more open. Recently the new Arnold Bennett Prize was established - open to all authors. Times are a-changin'. The Wales Book of the Year Award criteria should only be quality; not the number of pages, not the colour of the cover, and not the publisher. In Wales there is currently an independent review of the Welsh Government’s support for publishing and literature in Wales [source]. I've been liaising with the staff who are running the review about the terms of reference, the constitution of the panel of members, which stakeholders they will speak to, whether the review will address independent author-publishers, and issues to do with funding. The culture is slowly catching up to the connected and empowering world we live in, where there are more options than ever before. Let's hope they recognise this in their findings. Books appear in different ways. As everything else has opened up, so has publishing. The key factor isn’t how a book is published. It is how good the book is. That is the only thing that should concern readers. That is the only thing that should concern writers. That is the only thing that should concern awards. Forget the past: let's look forward to a future, in a changing landscape where there are many opportunities for everyone. It's an exciting time. Let's all move forward and embrace it. Indie vs Traditional Publishing: Which Path Is Right for You? Very disappointing. They used to allow independent books - I remember - so someone new in Literature Wales must have got in charge and been able to change things, presumably they had their own axes to grind (that's how it often works in such organizations). It's funny that they are meant to support authors, but look down on those that keep control of their rights.